As a law enforcement professional, I was waiting impatiently for the government’s recommendations for fighting gang crime. I’ve been especially impatient to see what kind of initiative they would come up with to attack the root of the problem: the cannabis trade. My disappointment when they announced what it was as great as my impatience had been. The right approach would have been to rob criminals of their source of income. Mientras la DEA se aferra en descalificar a sus exagentes Héctor Berrellez y Phil Jordan, otro más, Mike Holm, los defiende. Los dos primeros revelaron los entretelones del caso Camarena: la participación de la CIA y de la misma Casa Blanca en tiempos de Ronald Reagan. Holm, quien fue jefe de Berrellez cuando se instrumentó la Operación Leyenda, proporciona más datos novedosos: cuando se negociaba el Tratado de Libre Comercio de América del Norte, la DEA ordenó que no se reportaran los actos de corrupción por narcotráfico de ningún alto funcionario mexicano. Jamaica's current volatile security environment and its economic malaise are reasons enough to seriously consider joining their Latin American counterparts to debate a raft of new policy options, not only in rhetoric, but also through public policy. Our prison conditions and local magistrate courts are bursting at their seams from inmate overcrowding and case overloads for marijuana possession that amount to miniscule consumption levels. Una historia que parece sacada de una compleja novela de espionaje acaba de estallar en la televisión estadunidense: Enrique Kiki Camarena, el policía de la DEA asesinado en México en febrero de 1985, aparentemente no fue víctima del capo mexicano Rafael Caro Quintero sino de un oscuro integrante de la CIA. Este sujeto fue el encargado de silenciar al agente antinarcóticos por una grave razón: había descubierto que Washington se asoció con el narcotraficante y usaba las ganancias del trasiego de estupefacientes para financiar las actividades de la contrarrevolución nicaragüense. Si la finalidad de los esfuerzos de las autoridades de EE UU, Europa o Australia –los principales mercados mundiales- frente al tráfico de drogas consiste en dificultar el acceso a las sustancias estupefacientes, el resultado es un claro fracaso. Con ligeras excepciones y, a pesar de los esfuerzos destinados a combatir la oferta, el precio de la heroína, cocaína y cannabis se ha reducido sensiblemente mientras la pureza de estas sustancias ha sido cada vez mayor, según un estudio que publica la revista British Medical Journal. The global “war on drugs” has been such a failure that illegal substances are now cheaper and purer than at any period over the past two decades, warns a new report by the Vancouver-based International Centre for Science in Drug Policy. Data from seven international government-funded drug surveillance systems show that drug use should be considered a public health rather than a criminal justice issue. Police in Copenhagen have cannabis users in their crosshairs as they struggle to close the illegal drug trade in Copenhagen commune Christiania. Task Force Pusher Street, the police’s Christiania unit, has been active since September 2012 and claims to have cut the cannabis trade there by 30 percent and announced that they intend to step up efforts against cannabis. Copenhagen mayor Frank Jensen said that he would rather see the sale of cannabis legalised. Since the 1980s, there has been a major push in rhetoric and institution-building, emphasizing the centrality of attacking the financial lifeblood of drug trafficking networks and organised economic crimes. Much progress has been made in legislation and the creation of financial intelligence units. However, there are volumes of commentary and legal analysis, but almost nowhere in the world is there any systematic analysis of law enforcement or criminal justice inputs or outputs, let alone of outcomes in terms of reduced crimes of any kind or reduced harms arising from the ‘organised’ nature of crime. In response to the increased police presence in and around Christiania, a number of citizens are fighting back online. Fans of Christiania have long been using a Facebook page, 'Politi razzia på Christiania?' (PRPC), to inform one another of police presence in the freetown. The page has well over 9,000 likes and also been developed into an app for smartphones that allows people to check for police presence before heading to Christiania. The page was created in response to Taskforce Pusher Street. 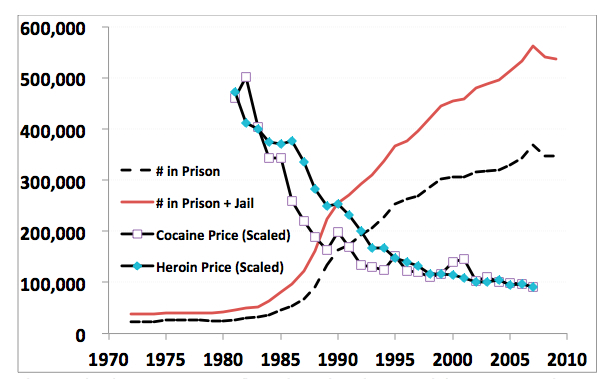 Law enforcement strategies have utterly failed to even maintain street prices of the key illicit substances. This figure shows that street drug prices fell by roughly a factor of five between in 1980 and 2008. Meanwhile the number of drug offenders locked up in our jails and prisons went from fewer than 42,000 in 1980 to a peak of 562,000 in 2007. We have remarkably little evidence that the billions of dollars spent on supply-side interdiction have much impact. In July 1989, the leaders of the economic powers assembled at the G7 Paris summit decided to establish a Financial Action Task Force (FATF) to counter money laundering as an effective strategy against drug trafficking by criminal ‘cartels’. However, since the inception of the international anti-money laundering (AML) regime there is a growing awareness that the regime is not working as well as intended. En julio de 1989, los líderes de los poderes económicos reunidos en la Cumbre del G7 en París resolvieron establecer el Grupo de Acción Financiera Internacional (GAFI) para luchar contra el lavado de dinero como una estrategia eficaz contra el tráfico de drogas de los 'cárteles' criminales. Sin embargo, desde el inicio del régimen internacional anti lavado de dinero (ALD) ha aumentado el convencimiento de que el régimen no está funcionando tan bien como debería. Across the UK, 7,865 cannabis farms were discovered in 2011-12, an increase of 15% on the previous year's figures and over double the number for 2007-8 when police found just 3,032. Previously cannabis cultivation was done on a larger scale by gangs, who would fully convert terrace houses, knocking down walls to make larger growing areas, taking electricity direct from the mains, to avoid triggering the suspicion of the energy companies over unusually high consumption. Recently, there has been a shift towards smaller-scale farms, in line with a national trend, identified by the Association of Chief Police Officers' 2012 report into the commercial cultivation of cannabis .